Have you ever spent some time watching bugs? Not watching to keep them off of your food, although I have spent an inordinate amount of time doing that. Too much time I suppose, but to be fair, the whole human race is concerned with bugs on their food. That is why we invented inside. Inside was pretty good, but bugs still managed to get on the food, so we invented doors, thus the term “indoors”. Indoors kept most of the bugs out, but once the door was closed, inside became very, very dark which was pretty scary. Now we had to invent windows for the daytime and fire for the night time, to let in enough light to kill bugs by. That night time saying that we give to kids “Nighty, night. Don’t let the bedbugs bite, but if they do, hit them with a shoe until they are black and blue!” I say hit them until they become a small, greasy spot on the wall, but each to his own. Nope, I don’t like bugs and no one else does either. I have no idea what is with those people in National Geographic letting the flies crawl on their faces. It’s possible that they have been driven insane by the bugs and just can’t get indoors, close the door and windows, find the biggest shoe available and beat the flies until they are black and blue. I think I’d rather die than get so used to flies on my face that I wouldn’t even swat them. Be that as it may, if you watch bugs you will see that they are very intense little creatures for the most part. Ants are always on the go trying to find more food for an ever increasingly large anthill. I can’t understand why they keep expanding. To my knowledge, mankind are the only creatures on the planet that keep expanding far past where and when it was prudent to expand. I guess I just don’t know enough about the life cycle of the common ant. Perhaps they need large numbers to protect the queen during inclement weather or times of drought. I would imagine if it gets real cold, they all huddle together to generate heat, and if they get hungry enough it pays to have a surplus of workers that you can have for dinner. I haven’t been able to figure out the purpose of butterflies and moths. They just seem to hang out all day, every day, arbitrarily flying from one place to another. 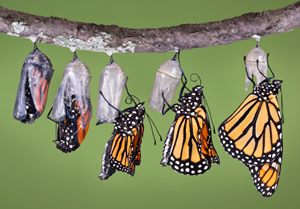 The most work they have ever done is to transform from a chrysalis to a butterfly. I’m sure it isn’t easy, but shouldn’t there be more. If that were what humans did, we would be born and then kick back and do nothing for the rest of our lives. Hmmmm…actually, that pretty much sums up my life. I guess I am the beautiful but lazy butterfly and the rest of you are those hard working, industrious ants. I envy you your dedication and focus. Keep up the hard work and know that at least one butterfly appreciates the effort you put in.